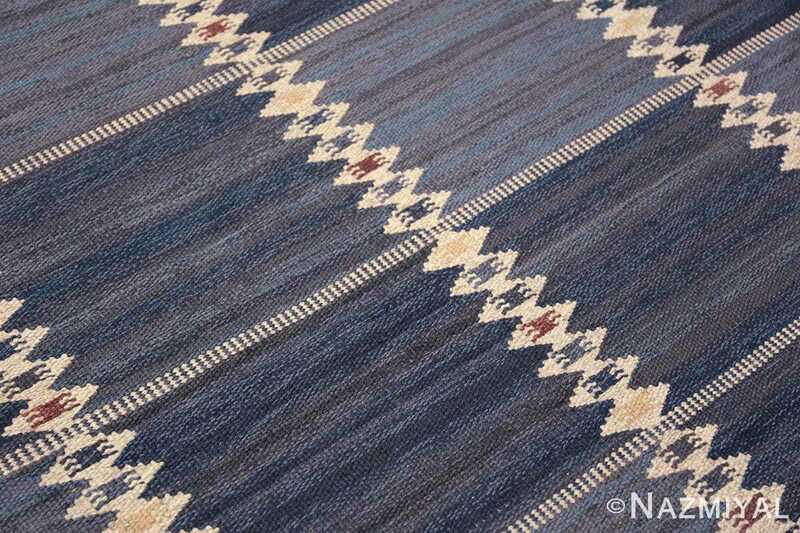 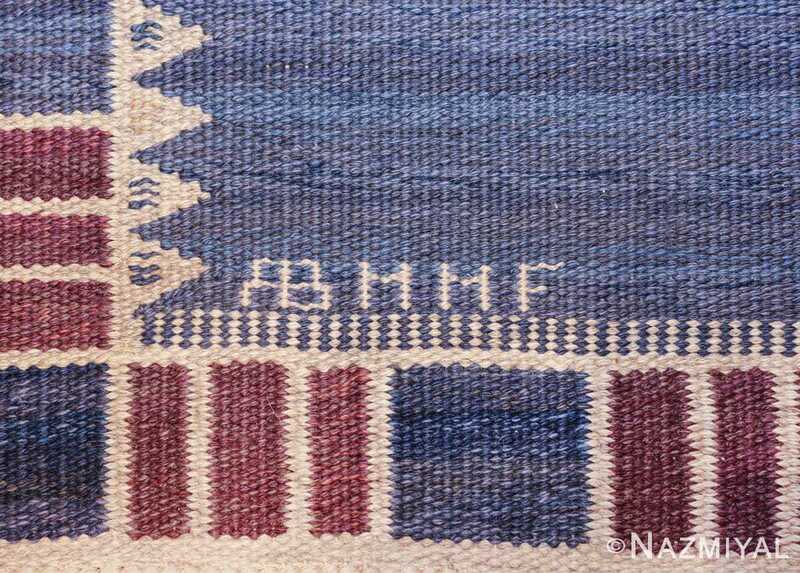 Breathtakingly Vintage Scandinavian Marta Maas Salerno Blue Kilim Rug by Barbro Nilsson, Country of Origin / Rug Type: Scandinavia Rug, Circa Date: Mid – 20th Century – This beautiful vintage Scandinavian Marta Maas carpet, titled “Salerno Blue”, was designed by the iconic Barbro Nilsson. 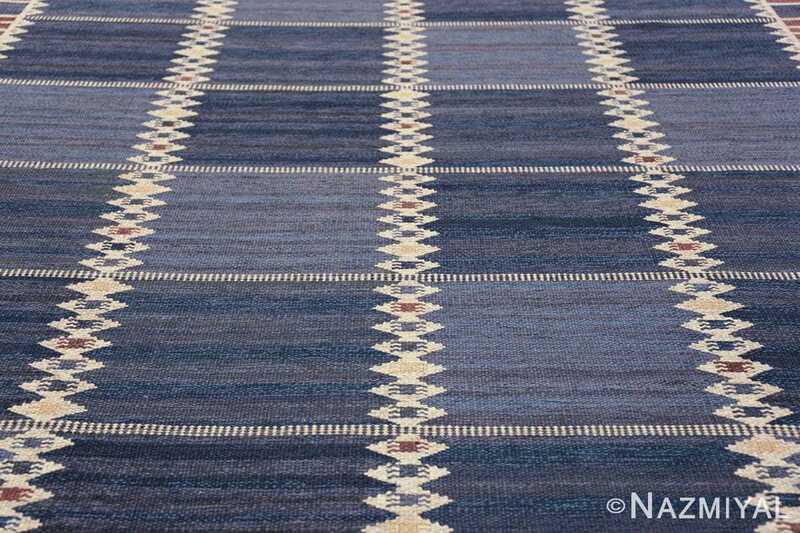 This magnificent vintage mid century carpet features a field design that is comprised of twenty eight mostly solid squares that are separated by zigzagging white diamonds as well as white speckles. 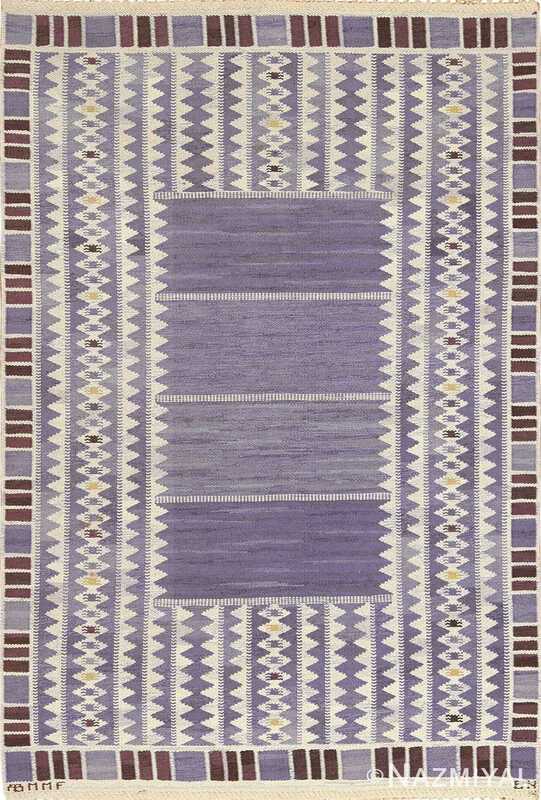 A tile border pattern made up of repeating three purple rectangles, flanked by mostly solid blue squares completes the masterpiece with elegance and colorful zest. One of the most mesmerizing visual impressions of this work of textile art is created by the beautifully designed white elements. 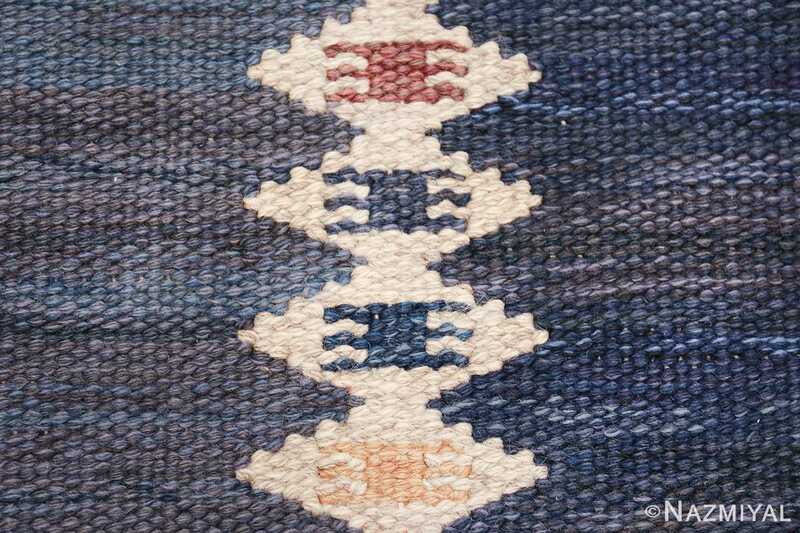 The most noticeable and interesting of these elements are the zigzagging strings of white background diamond shapes which create five slender columns. These zigzagging patterns create just enough distance between each column of blue squares to give it a more open and artistic feel. 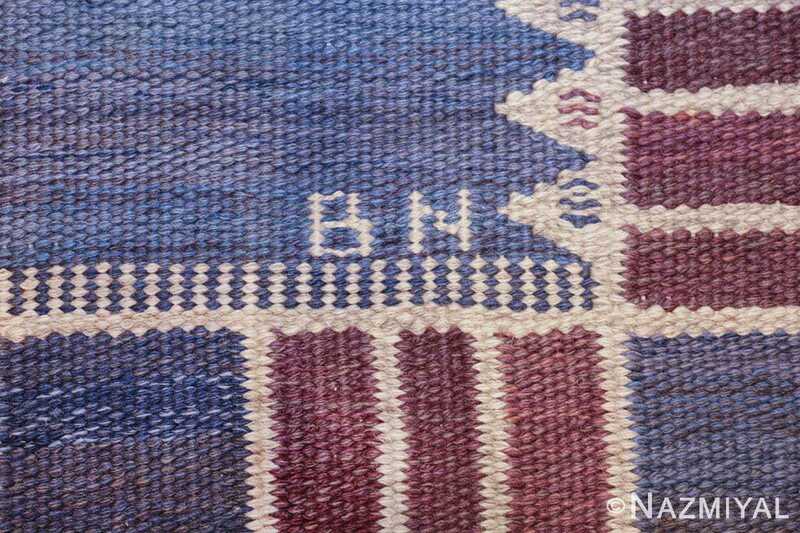 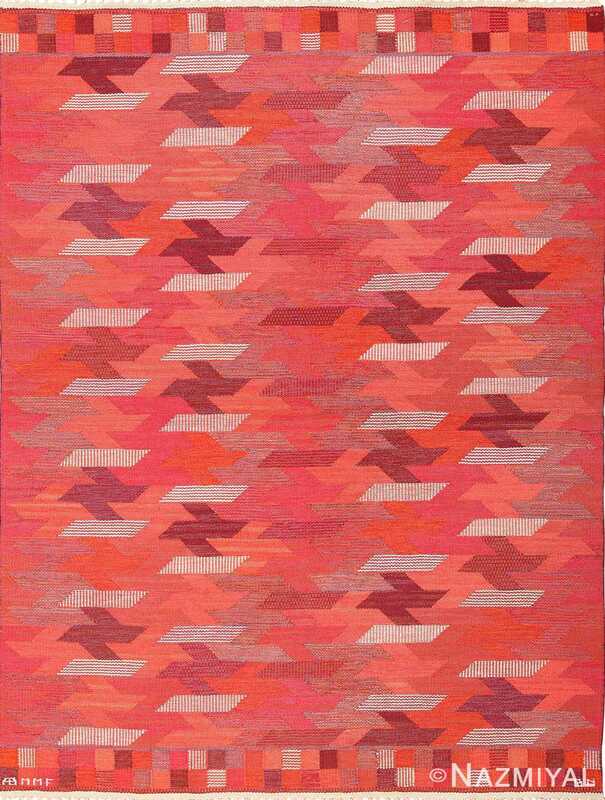 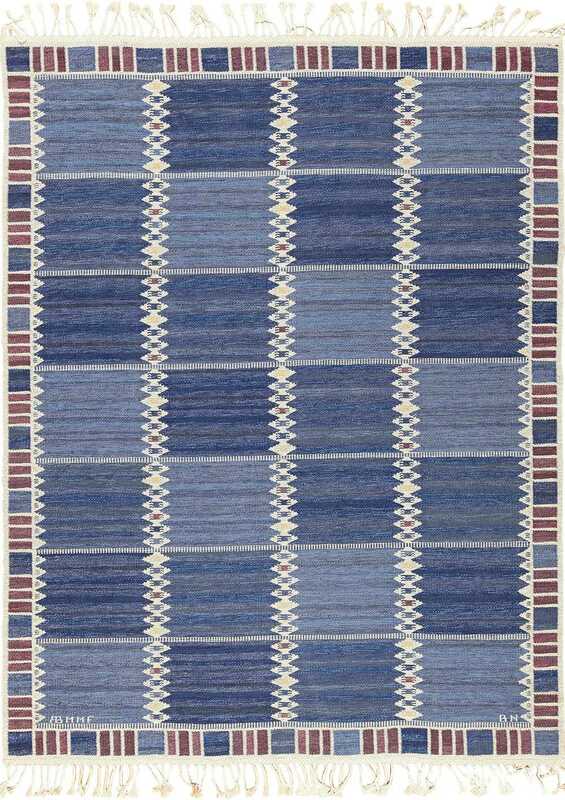 The actual blue tone design that is used in the majority of the Barbro Nilsson rug’s design varies sporadically from square to square. 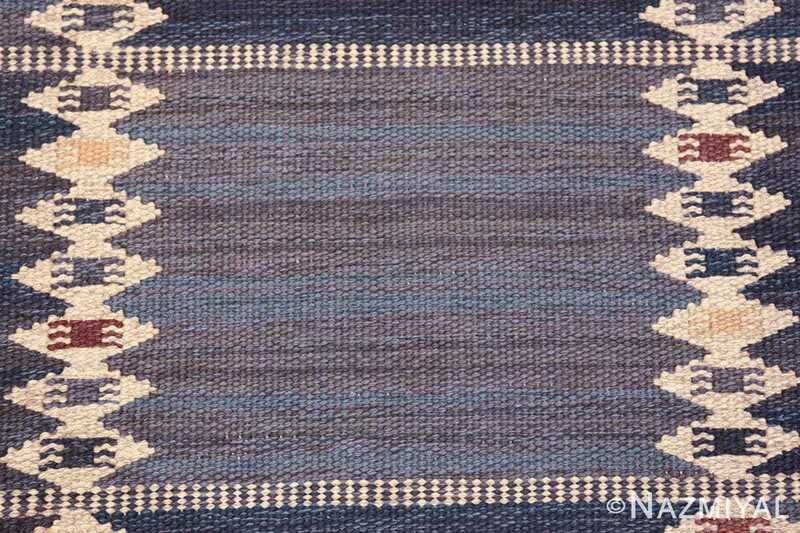 For example, a deep royal blue is used in some of the squares while a lighter sky blue is used in the others. While, at first glance, there seems to be no particular order for the placement of these different blue hued squares. 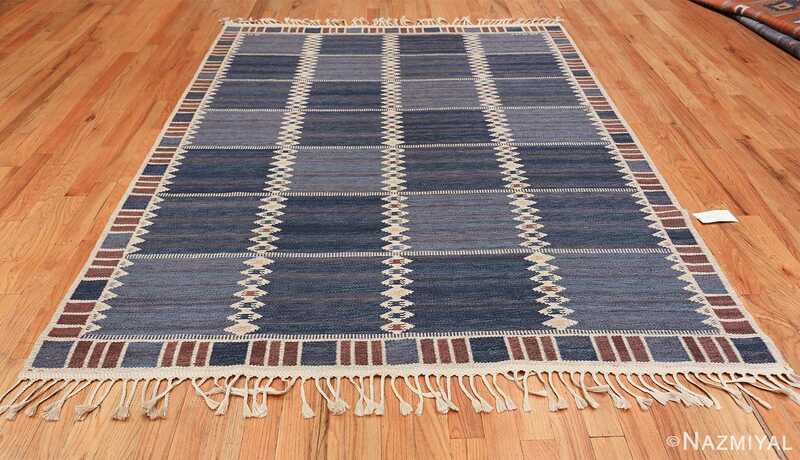 But As one spends more time examining this Marta Maas Salerno Blue Kilim rug, as if creating order from chaos diagonal patterns begin to emerge. 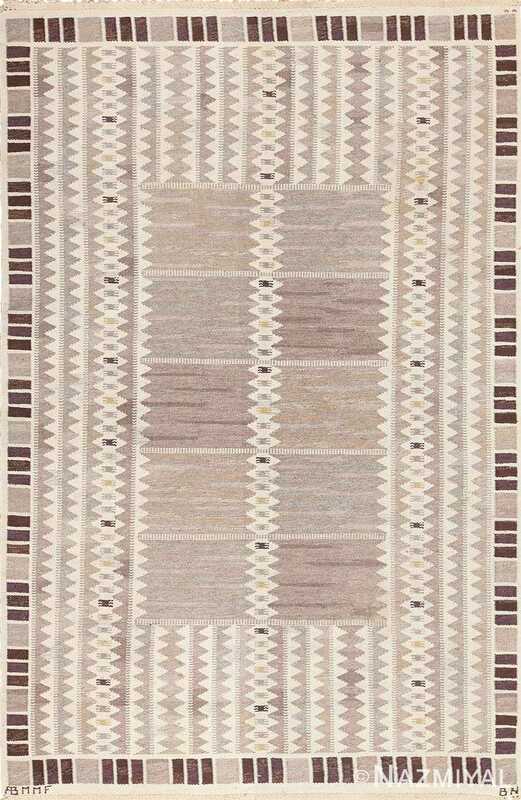 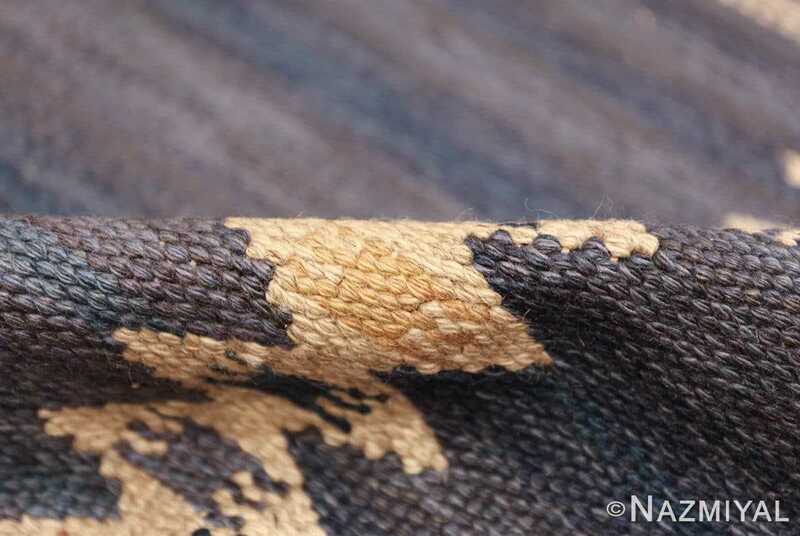 The subtle artistic composition of this beautiful Scandinavian rug is indicative of just how much time and effort went into every aspect of creating this magnificent flat woven kilim rug. 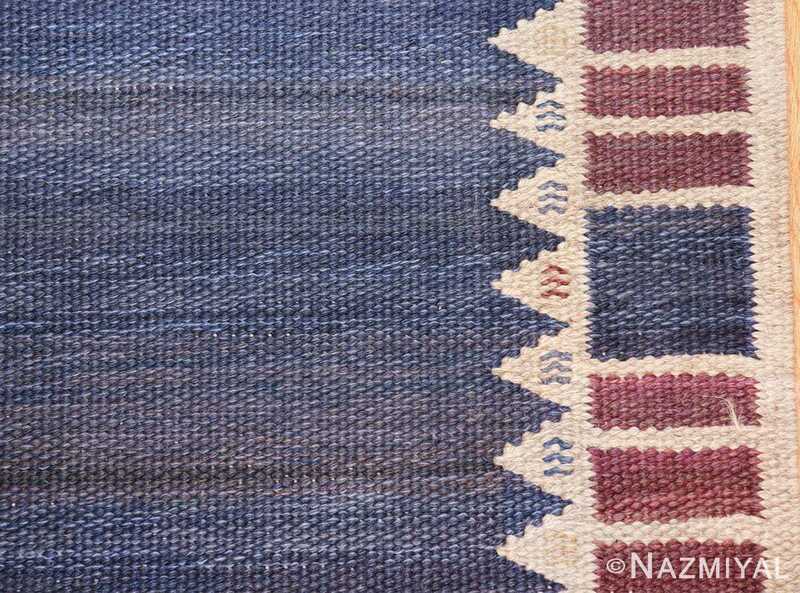 The overall visual impression of this Marta Maas Salerno Blue kilim rug is one of refined grace, order, calm and elegance. 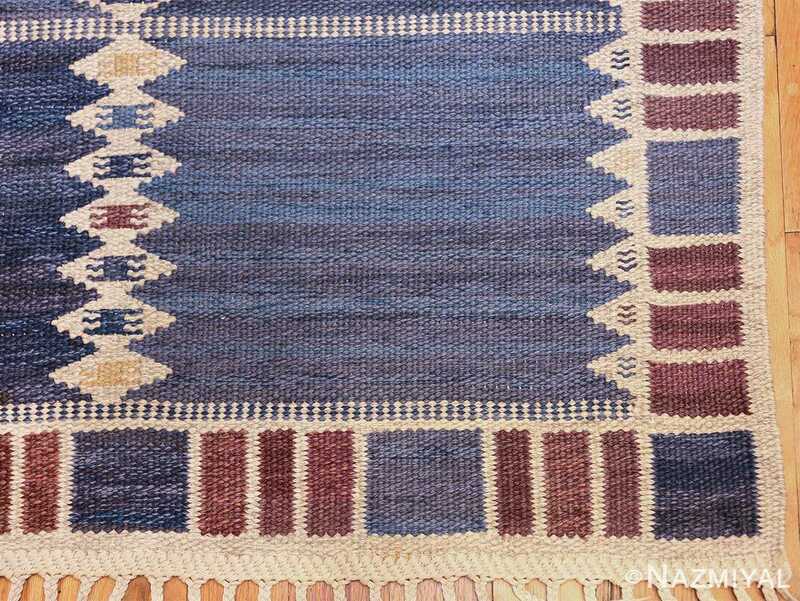 The end result is a marvelous masterpiece that will add a charm, beauty, and appeal to any interior designed space.